All Stars, Sole Prop, provides professional cleaning services for homes and business establishments based in the Greater Hermanus area – from Arabella to Voelklip. Services may be contracted to be ad hoc or regular. Rates may differ according to frequency as well as time of day and level of supervision. Cleaning services of a high quality that can be customized to specific needs. The ‘rent-a-char’ service for ad hoc work and holiday rentals is very popular. Team cleans are also available and provide a solution where time is short. Laundry can be done on or off site. Key Keeping Services are also offered or keys can be picked up from Security Service providers. Half Day 4 ½ hours (5 hours or more = Full rates). Transport is included in these rates for Hermanus suburbs from Vermont to Voelklip. For areas further away, please request a quote for transport. Supervised cleaning teams can be organised according to the type of clean and size of house. The pricing of these teams is based on the makeup of the service you require and is based on the prices quoted above. Rates start at R350. Laundry done off the premises will be charged for – at char daily rates plus materials and equipment charge. When doing laundry on a clients premises and laundry facilities that are required are not available (no wash-line, washing machine, dryer) All Stars will take off-site and charge accordingly. All Stars is happy to keep keys for regular client or collect from your security company and the charges are included for team cleans. Should you wish us to open / close in other instances; a charge of R80 will be made. Payment for services is strictly cash or 30 days by arrangement – interest will be charged on overdue accounts. Payment must not be made directly to the domestic workers. A payments made to them would be treated as a tip. Electronic payments can be made into the All Stars bank account. Please note that a responsible All Stars staff member will open and close houses ensuring that the house is secure and where there is one, the alarm light is on. All Stars will not accept responsibility for theft or damage while keys are in their care – the client must accept the risk. Cancellations (or failure to open) on the day will be charged for in full. Cancellations of pre-bookings during peak season or out of season cancellations with less than 24 hours notice will be charged for at 50%. Should an All Stars employee be offered a permanent position by a client, the client will be charged a once off placement fee equal to one week’s pay with a minimum of R500. 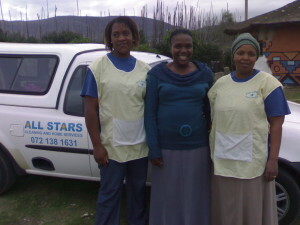 Please note that All Stars staff are trained to use domestic equipment of most kinds and will take care of them when being used. Great care will also be taken of household fixtures and contents being cleaned. All Stars and their employees however cannot be held responsible for breakages of equipment and household items unless gross negligence can be proved.